Discover with Dr. Cool was created by a husband and wife team, Jordan and Katie Willing. Both possess a passion for science and children which is why they only produce kits that offer exciting hand-on experiences that will inspire young learners with the wonders of the natural world. Every Dr. Cool Science kit is exciting and engaging for students, as well as a valuable contribution to the curriculum of any teacher, homeschooler, or parent. Some of their adventurous kits include gem mining, crystal growing, dinosaur digging, geode breaking, fossil digging and gold panning. Christmas is just around the corner and if you are anything like me I am sure you are on the search for amazing gifts that are unique and will provide your children with hours of fun. Well the Learn How To Pan For Gold kit is an amazing product that offers children a fun, learning adventure. A couple months ago we visited Dahlonega, Georgia, which is the site of the first major U.S. Gold Rush. Well as you can imagine both of the children became fascinated with gold after our trip and ever since then have been on the search for gold in our local rivers. But since they lack the proper tools and panning technique their attempts have not been very fruitful. Which is why I knew The Learn How To Pan For Gold kit would be the perfect gift for them this Christmas. 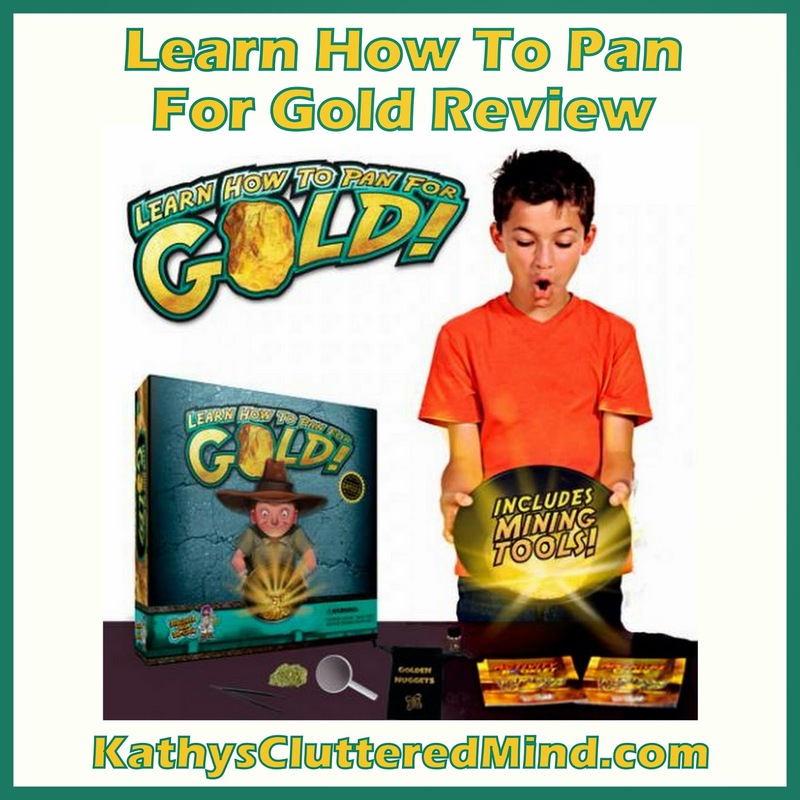 The Learn How To Pan For Gold kit is the perfect gift for little prospectors age 6-12 years old. This award winning toy will provide hours of fun and learning. The hands-on science kit includes a 10" prospectors pan, tools, storage vial, practice and advanced miner bags of paydirt, plus a large fool's gold nugget (pyrite). There is also a full color adventure and activity guide which were written by teachers. The adventure guide include lots of amazing science and history facts about gold. And the activity guide includes 10 fun games, puzzles and challenges. Before digging into the kit I read over the instructions which explain the gold panning technique. The instructions were super easy to follow and include photos for reference as well. Since I do intend to give this to the children for Christmas I was the one who played with the kit, and I must admit I had a blast. Boy is gold panning harder than it looks. With lots of patience and practice I worked my way through the practice paydirt bag and EUREKA, I found the gold! Note: the gold in the kit is not actually gold, it is just pyrite, but it definitely teaches children about the art of gold panning. And after they have mastered the included paydirt bags they can move onto local streams and perhaps find real gold. You can also purchase mining bags of real gold online from various sellers. This kit is the perfect way to enhance history and science lessons. Dr. Cool kits are so much fun that children won’t even realize they’re learning! The Learn How To Pan For Gold kit is regularly $14.95, but right now you can get it for just $7.50 off the Dr. Cool website ($7.50 price expires 10/31/14). The kit is also available on Amazon.